Promoting bicycling as an everyday means of transportation and recreation. Advocating for cyclists and safety. 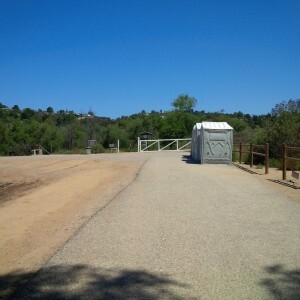 While road cyclists have been traversing the Irvine Ranch roads through the canyon since the 1960s– before the advent of mountain bikes– there was no mention of official access until Orange County Flood Control included the main dirt road and path in its plans to provide a paved Class 1 mult-use trail in the 1980s. Pavement Ends, lower Peters Canyon. A few years ago Orange County Beaches and Parks took over most Class 1 trails, existing and planned, from Flood Control. 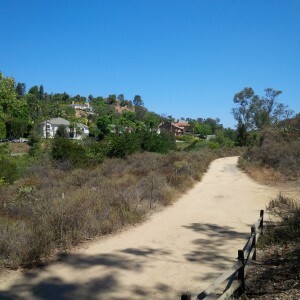 And the plan for the Class 1 was included in that agency’s development of Peters Canyon Regional Park. “Don’t pave Peters Canyon,” and “let them ride on Jamboree” seemed the sentiment of those opposing the multi-use trail. Private park access for a privileged few. While such statements are NIMBY and bigoted, Peters Canyon’s value as an island of undeveloped land in a sea of suburbia cannot be denied. 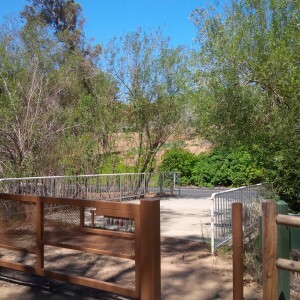 While a Regional Park, the majority of users come from the surrounding communities, many walking in from public parking areas or via private trails from adjacent gated neighborhoods. The Park’s dusty trails are well trampled, some quite eroded by heavy use. And while the whine of gardeners’ leaf blowers and mowers, the coming and going of residents’ cars on the adjacent road belies any “wilderness” claims, the Park is for the most part tranquil. The northern reservoir fosters a willow and sycamore nesting habitat for a variety of birds, spring and fall it provides stop-over for migrating waterfowl. The southern end of the canyon is dominated by a catch basin bounded on the east by a paved service road. A dirt road continues north from there over the upper dam where it once connected with Jamboree Rd. The plans Flood Control originally proposed amounted to rolling asphalt over that main service road/ foot path. Today that would not be acceptable. Whatever plan is ultimately adopted, the rural experience of the Park for pedestrians and equestrians has to be respected. 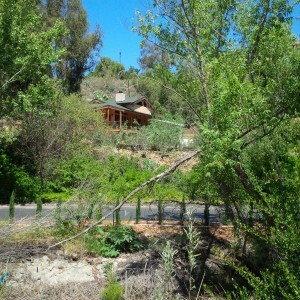 Viewshed encroachment and invasion of non-native plants betray claims of “wilderness” in Peters Canyon. Until three weeks ago the only voices weighing in were from those groups. And it’s understandable that they don’t want to share. But mid July we attended the OCTA Board Meeting and spoke in defense of the Class 1 trail, which is part of that agency’s Master Plan of Commuter Bikeways. Supervisor Todd Spitzer seemed surprised that anyone would choose that time and place to defend county plans to connect the Mountains to the Sea Trail, but there we were. Plenty of room for a Class 1 trail separated from pedestrians and equestrians, and screened by vegetation. As a result on July 28 a small delegation representing voters and park users from outside this community got 40 minutes from Supervisor Todd Spitzer’s Policy Advisor, Carrie O’Malley. Bruce Bauer, attorney representing the “Heart of OC” bicycle loop, OCBC Board Member Brian Cox, and well known transportation advocate, Brenda Miller made a rational case for promoting non-motorized transportation alternatives, the value of connectivity to existing segments of the Peters Canyon Trail, and equity and access for diverse user groups of our Regional Parks. Will it impress the Supervisor? Time will tell, but we are at last being heard. At this point that’s progress, indeed. This workshop will summarize data collected and present park planning alternatives. Participants will be invited to provide comments. Come show your support for a Class I bikeway through the park, as shown on the Master Plan of Major Riding and Hiking Trails and Off-Road Paved Bikeways. More information on the planning process is available at the Peters Canyon General Development Plan page. OCBC is proud to announce our first CyclingSavvy course of 2015 on April 24th and 25th in Orange. tools to read and problem-solve any traffic situation or road configuration. The course is offered in three 3-hour components: a bike-handling session, a classroom session and an on-road tour. The classroom and bike-handling sessions may be taken individually, the road tour requires the other two as a pre-requisite. The object of the course is not to turn people into road warriors. Being a confident, competent cyclist has nothing to do with speed or bravado. You don’t need either of those things to have access to the entire transportation grid. Even most confident cyclists prefer to use quiet routes when feasible. In many cases, it is only an intimidating intersection or short stretch of busy road which hinders a cyclist’s preferred route. This course is designed to show students simple strategies to eliminate such barriers, and ride with ease and confidence in places they might never have thought possible. …all you really need is one person to show you the epiphany of your own power and you’re off. If you can hand somebody the key to their own power… the human spirit is so receptive… if you can do that and open a door for someone at a crucial moment… you are ‘educating’ them in the best sense. You’re teaching them to open doors for themselves. In fact, the exact meaning of the word “educate’ comes from the root word ‘educe.’ It means to bring forth what is within. To bring out potential. Our course is designed to be taken as individual sessions or as a complete course. Train Your Bike (bike handling) and Truth & Techniques (classroom session) can be taken individually in any order. To sign up for a Tour of Orange, you must have taken or be signed to take the other two classes prior to the tour class. Individual sessions are $30 per session. A package of three sessions (the full course) is $75. A package may be used to take the sessions at any time. Through guided discussion with video and animation, this session familiarizes students with bicycle-specific laws, traffic dynamics and problem-solving strategies. Students discover that bicycle drivers are equal road users, with the right and ability to control their space. This session is an experiential tour of the roads in the city of Orange. The course includes some of the most intimidating road features (intersections, interchanges, merges, etc.) a cyclist might find in his/her travels. The students travel as a group, stopping to survey and discuss each exercise location. After observing the feature, discussing the traffic dynamics and the best strategy for safe and easy passage, the students ride through individually and regroup at a nearby location. * The Tour session is only available with the full course. The other two sessions may be taken á la carte, in any order. To ensure that your bike is in perfect operating condition for the class, Jax will extend a 50% discount on the labor charge for a “basic service” at any Jax Bicycle Center for anyone who signs up for a Cycling Savvy or TS 101 class. The basic service is $69.99. Jax will provide a coupon to anyone who signs up for one of the classes for 50% off on the labor charge ($35.00). Any parts that are needed for the service will be at the regular price. Email lci@ocwheelmen.org if you would like a coupon for a tune-up!